1A Tax Initiative – Is Elder violating the law? We have reviewed the actual verbiage of the 1A tax initiative which was approved by the voters back in November of 2012. If you would like to see the document Click Here. We are concerned Bill Elder has transferred large numbers of personnel from General Fund to 1A funds and is setting the office up for a huge crash in 2020. At first glance it appears Elder is not technically in violation of the ballot measure wording. Ballot Wording. However, having said that it is clear you can not spend the money on anything that is not specifically listed. Because it says “Civilian Support Staff” that pretty much opens pandora’s box for wasteful spending. But no where does it say any sworn positions other than “Deputies”; but by Colorado state law that could include any rank other than Undersheriff or Sheriff. However, the tax initiative clearly says under Law Enforcement “Additional Patrol Deputies”. This would not include Commander Kramer or Lt. Donels; both of which are being funded by 1A funds and are clearly NOT “Additional Patrol Deputies”. Plus, Deputies in the Mounted unit are also NOT “Additional Patrol Deputies”. It’s been a while since Deputies have “Patrolled” on horseback. Obviously because the wording includes “Investigators” it also opens the door for Elder to transfer Detectives to 1A funding. Again this will cause huge problems in 2020 if no follow on funding is obtained through another tax initiative. These questionable decisions by Elder do not, by our opinion, constitute “corruption”. However, add the fact he has taken the money freed up to hire his friends with questionable qualifications and who were campaign contributors; it definitely gives the appearance of “corruption”. It appears there are some positions funded by 1A that are in violation of the ballot measure. There should be a yearly external review (as specified in the ballot measure) to ensure compliance. We reviewed a budget presentation given by Elder entitled; “2017 Balanced Budget Presentation” which we believe might have been presented to the Board of County Commissioners. It’s unique to see a “Budget” presentation that doesn’t provide a budget. This presentation does not show any financial numbers. 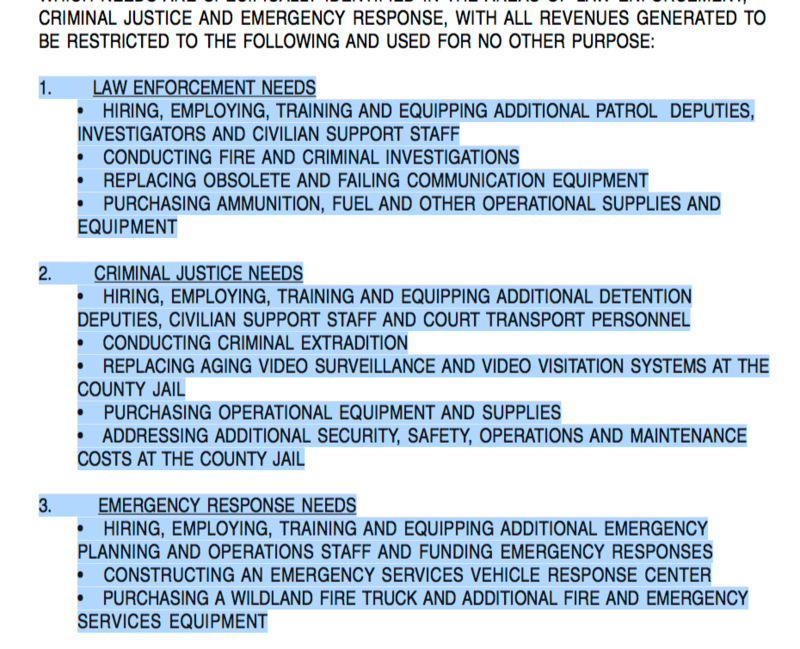 In fact, after reviewing this presentation you will not even know how much funding the El Paso County Sheriff’s Office receives. Are the Sheriff’s Office books audited each year? We could not find any reports. It is questionable if there are any competent financial experts at the Sheriff’s Office. Maybe someone should do a CORA request for Larry Borland and Brian McPike’s resumes (which are required for employment). They are the financial experts, it would be interesting to see how much experience they have in finance. In fact, ask for the resumes of everyone who applied for McPike’s position. Was he really the best candidate? The last part of the ballot wording says something interesting. Sheriff Bill Elder owes the community a yearly public document laying out the revenues and expenditures from the 1A tax initiative. Read the actual wording. We could not find any annual report or any reference to a Citizens’ advisory committee. Does a committee exist? It appears Bill Elder might be in violation of the tax initiative. If he cannot produce any annual reports and documentation concerning a citizens’ committee for the last 2-3 years there needs be an investigation. The taxpayers need proof their money is being spent in accordance with the ballot language and the law. We did find the first 1A yearly report completed during Maketa’s term. It lays out every penny with great detail. Click here to read the report. The facts are clear and sources provided. It appears Sheriff Bill Elder is not in compliance with the 1A tax initiative and might be in violation of state law which justifies an investigation and audit of the El Paso County Sheriff’s Office going back since Elder took office. There should also be an investigation by the District Attorney’s office to determine if any laws were violated. The taxpayers of El Paso County deserve a complete independent audit concerning 1A funds since its beginning. We do not believe it is too much to ask for our elected officials to follow the law. Where is the transparency?